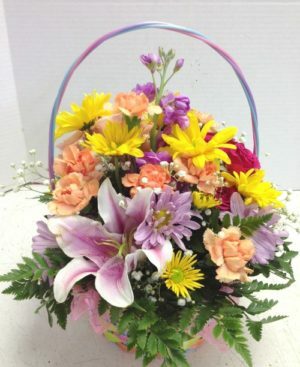 Spring flowers such as carnations, lilies and stock are designed in a colorful spring basket in colors such as yellow, pink and lavender. 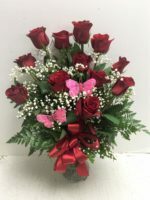 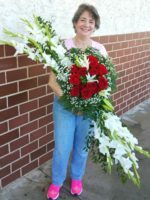 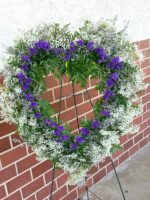 Perfect for a centerpiece at a party or festive event, this is a great way to welcome the season and bring spring into your office or home. You’ve heard the expression: Let is snow. 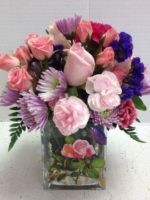 Well, it’s about time for spring, so we’re introducing our Let It Spring fresh floral bouquet! 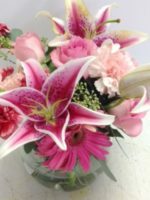 Spring flowers such as carnations, lilies and stock are designed in a colorful spring basket in colors such as yellow, pink and lavender. 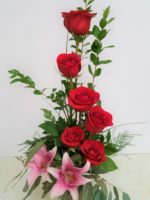 Perfect for a centerpiece at a party or festive event, this is a great way to welcome the season and bring spring into your office or home. 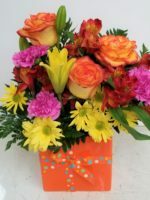 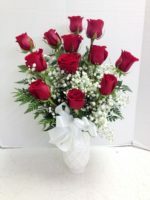 You might prefer celebrating spring with this great gift basket or tulips and gerbera daisies.